On this page you can download C&C Tiberium Wars Demo. 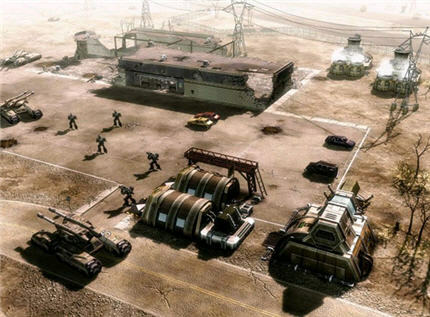 Electronic Arts has released a playable demo for Command & Conquer 3 Tiberium Wars. The demo allows you to try out their upcoming 3D real-time strategy sequel by EA Pacific. The demo includes one tutorial mission, two single-player missions featuring live action video sequences, one skirmish map with three different difficulty settings, and one trailer featuring Tricia Helfer, Grace Park, Michael Ironside. Description: One tutorial mission, two single-player missions featuring live action video sequences, one skirmish map with three different difficulty settings, and one trailer featuring Tricia Helfer, Grace Park, Michael Ironside. Note: If you have problems downloading C&C Tiberium Wars Demo, please try to stop using your download manager and avoid right clicking on files. Also, check your firewall settings, because some mirrors may require that you do not block the HTTP referrers.